I don't normally comment on earning's calls, but this is something I've been talking a lot about in meetings offline so I decided to write up a short post. Yesterday NVIDIA announced its Q2 earnings. In short, they were good. Total revenue was up to $1.04 billion and gross margins were healthy at 51.8%. The more interesting numbers were in the breakdown of where all of that revenue came from. 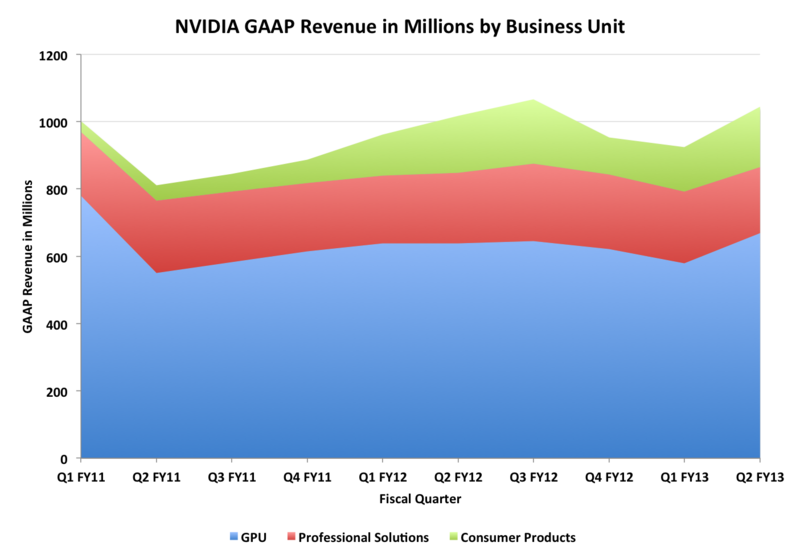 NVIDIA reports on revenue from three primary businesses: GPU, Professional Solutions and Consumer Products. The GPU business includes all consumer GPUs (notebook, desktop and memory - NVIDIA sells GPU + memory bundles to its partners) as well as license revenue from NVIDIA's cross licensing agreement with Intel. The Professional Solutions business is all things Quadro and Tesla. Finally the Consumer Products business is home to Tegra, Icera, game console revenue and embedded products. The quarter that just ended was NVIDIA's second quarter for fiscal year 2013 which is why the quarter stamps along the x-axis look a bit forward looking at first glance. Going back two years ago, the consumer products business was virtually nonexistent. Two years ago NVIDIA's consumer products sales were one quarter what they are today. The growth in the Tegra space has been steady since then, but late last year it saw a bit of a fall off (Tegra 2 wasn't exactly competitive in the second half of 2011). NVIDIA boasted healthy growth this quarter thanks to some fairly high profile Tegra 3 design wins, but the overall revenue for the consumer products group is still below its $191.1M peak three quarters ago. There's still a lot of hope for the business and it's definitely healthier than it was a couple of years ago, but there's still a long way to go. Ultimately NVIDIA needs to produce designs competitive enough to last until the next design cycle, and not taper off early. Tegra 2 was late to market and thus its competitive position was understandable at the end of 2011. Tegra 3 did a lot better but the real hope is for its Cortex A15 based successor, Wayne. The dip back in Q2 FY11 has to do with bumpgate, but if we look at Q3-FY12 and Q2-FY13 gross margins remained healthy during Tegra's two biggest quarters. This isn't enough data to conclude for sure that Tegra is selling at good margins, but it's promising for NVIDIA as a whole for now. Today NVIDIA's 28nm GPUs are selling at what appears to be very healthy margins. NVIDIA seems to have no problem selling nearly everything they make, at very good (for NVIDIA) prices. It's entirely possible that better than average GPU margins can help offset lower Tegra margins. It's also possible that both the GPU and consumer products businesses enjoy healthy margins. 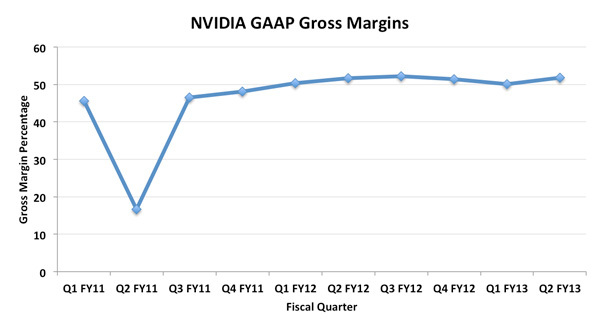 At the end of the day, NVIDIA had a good quarter and Tegra remains an important part of the business. NVIDIA has a couple of high profile design wins with Tegra 3 in Windows 8 devices later this year, including Microsoft's Surface tablet. The real question is how good will Wayne be next year. What I've heard thus far is promising, but I don't have any hard data yet. I suspect we'll also really begin to see the impact of processor graphics integration next year with Haswell. NVIDIA doesn't break down GPU revenue by market segment so it's unclear how much of a loss the consumer products division would have to cover should more OEMs choose to leave discrete GPUs out of their systems. The good news for NVIDIA is the high end (and quite profitable) GPU market is likely safe for the near future. The question remains how big of an impact we'll see at the entry level and lower midrange segments. A lot of that really depends on the success of Ultrabooks, Windows 8 tablets and other ultra small form factor machines that may not prioritize discrete GPUs. For now it's clear the Consumer Products group and Tegra has legs. NVIDIA's margins and revenue have improved over the past two years but there's a lot of room to grow on the back of smartphones and tablets. NVIDIA has done surprisingly well with Tegra over the past couple of years, especially in the face of some very strong qualcompetition. We'll find out soon enough if Wayne has what it takes to give NVIDIA's Consumer Products business its first $200M+ quarter. "Overall weakness in the global economy, softer consumer spending"
Nvidia won the design wins for the summer notebooks as well as the refresh of the macs. Most computers with dedicated graphics are coming with nvidia 620m to 670m. While the radeon cards 7700 and 7800 series are practically non existent in summer laptops. This is ironic since the previous year the situation was reversed. AMD= cya for fanboy consumption. It worked wonderfully for amd, as right here, the amd fanboys were spewing the company line like sheepled parrots and added on the attacking moan that nVidia lost market share to AMD and blah blah blah. So the thing is whatever lie AMD tells it's many deprived and deluded minions, they will swill down with drunken abandon, regurgitate while puking it back out in sensationalized form, and add their own mental farts off the top of their empty and fact less heads in attacks on Intel and nVidia. The ironic thing, considering that nVidia is a GPU manufacturer, is that Tegra's weak point has always been their GPU. It's hard to differentiate on the CPU if you're just another ARM licensee. Qualcomm does, since they design the CPU themselves, and nVidia has tried with the fifth low-power core, but ultimately there isn't much of a difference CPU-wise between a Tegra 3 and any other quad-core Cortex A9 chip. The place where we do tend to see differentiation is with the GPU, since there are currently four popular mobile GPU brands (PowerVR SGX, ARM Mali, Qualcomm Adreno, and nVidia GeForce ULP). To date, however, the GeForce ULP has always been significantly slower than the competition. Tegra 4 ("Wayne") will certainly benefit from the jump to the Cortex A15, which by all accounts should be a beast of a chip. But everybody else will be making the jump to the A15 as well (excepting Qualcomm, who is already shipping an equivalent product). The real question will be, is Wayne's GPU going to be competitive? Because that hasn't been the case for any Tegra parts to date. That's probably because they did it on purpose. Focus on CPU cores, and make the GPU simply "good enough", not great. Tegra 3 with 4+1 cores is about 80 mm^2. For comparison, exynos 4210 is 118 mm^2 and apple A5 is 120 mm^2, and both are dual-cores. Of course, nvidia uses a 40nm process and samsung and apple 45nm, but that alone wouldn't result in such a difference. They've been working on Kepler, then mobile versions of Kepler will come out. In the meantime they used the existing GPU (several years old) since they knew Kepler was about finished.